> Valentine’s Day Feb 14th!! Don’t forget your loved ones this Friday or you’ll be in the dog house! You can still order online today for it to arrive in time. Great Sweet Treats! 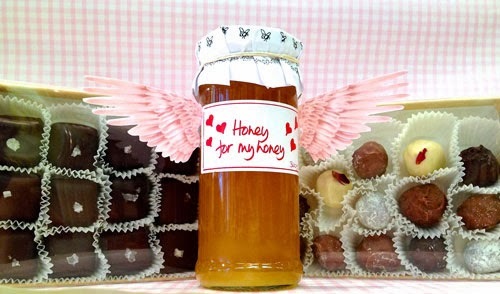 We have a special , ‘Honey For My Honey‘ filled with English wildflower honey (wings not included). Also a Fab Favourite, our Chocolate Honey Sea Salt Caramels or our assorted Chocolate Honey Truffles. Each one hand made using our own pure English honey. Comes in a vintage style brown embossed box, each chocolate placed in a white fluted tissue paper case. Finished with a raffia bow.